May just as well turn out to be a beaut. You can always tell the women guns by that. (And this may happen any night to you). Pray, what is any gentleman to do? And with a genteel protest be content. NEW YORK, Dec. 7. — (AP) — Another “bobbed haired bandit” has started work in New York. As her four male companions, armed with automatic pistols, held up the proprietor and 12 patrons of the Joy Inn, Brooklyn, the counterpart of Celia Cooney, now in Auburn prison, sat at a table calmly smoking a cigarette. Once or twice she nodded her crisp bobbed head in approval as the victims yielded money and jewelry. 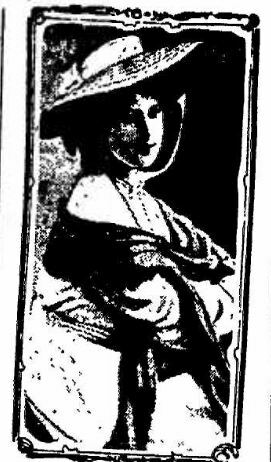 When the holdup was finished and $500 had been stolen from the cash register and from guests, who had been torn from their women companions, the girl led the retreat to a side street, where the party entered an automobile and disappeared toward Manhattan. The girl, described as an attractive brunette, was about 25. 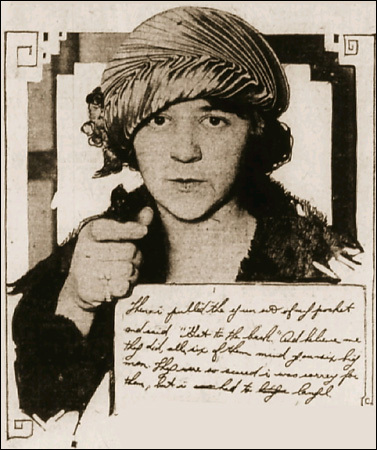 Celia Cooney, the original bobbed hair bandit, whose exploits became known nation-wide, was arrested with her husband, Edward, in April 1924, and both were sentenced to from 10 to 20 years in prison. They had participated in more than 10 robberies at the pistol point and in one instance wounded a man. *Hm, I wonder what the “Joy Inn” was, exactly; and if the “guests” went home to tell their wives how they lost their money, lol. 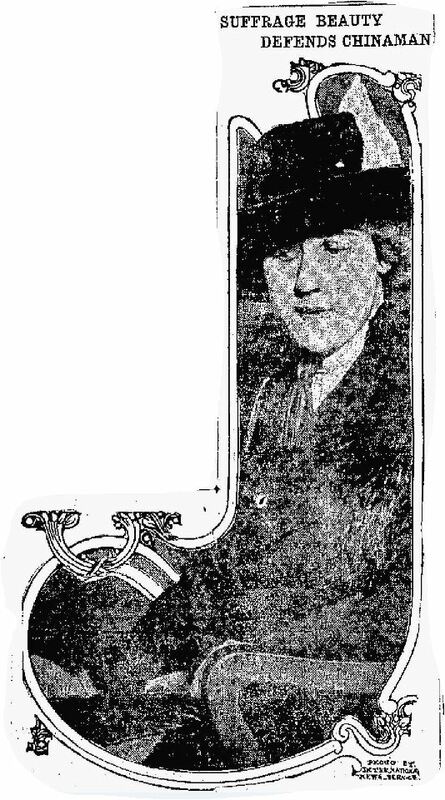 Miss Inez Milholland, whose picture is here shown is the daughter of J.E. Milholland, the millionaire pneumatic tube system man. She is now in the Junior class in Vassar and announces her intention of becoming a truant officer so that she may pursue the work of reforming bad boys. Miss Milholland is an athlete of note in the college games, and has had great success in reclaiming bad boys. Miss Inez Milholland, Who Wants to Vote, Roused Oxford and Cambridge. After trying with vigor, but in vain, to convince the authorities of Oxford and Cambridge universities in England that she should be permitted to study law at one of the two venerable institutions Miss Inez Milholland of New York sailed for America to try her persuasive powers at Harvard. Miss Milholland has won fame as a young leader of the suffragists. She was recently graduated from Vassar, where she conducted a vigorous campaign in favor of women’s votes. She is the daughter of John E. Milholland of New York and London, and a background of wealth has not lessened her charm. Her bronze hair, large blue eyes and well modeled features make her a classic type. At Vassar Miss Milholland kept President Taylor on the rack, inciting miniature equal rights resolutions among the students. When the suffragists of the state journeyed to the capitol at Albany for their annual hearing on woman and the vote the president peremptorily forbade Miss Milholland to accompany them, fearing her presence would accentuate the rumor that the college was a center of the woman’s rights campaign. Aside from her political tendencies, Miss Milholland made no mean record at Vassar. Her scholarship put her well in the fore, and her athletic prowess was the boast of her associates. As captain of the hockey team she led her players to a victory that captured the interclass championship. She was conspicuous on field day and champion in putting the eight pound shot. There was as much excitement in suffragette headquarters Thursday as if the New York legislature were about to grant women the right to vote. 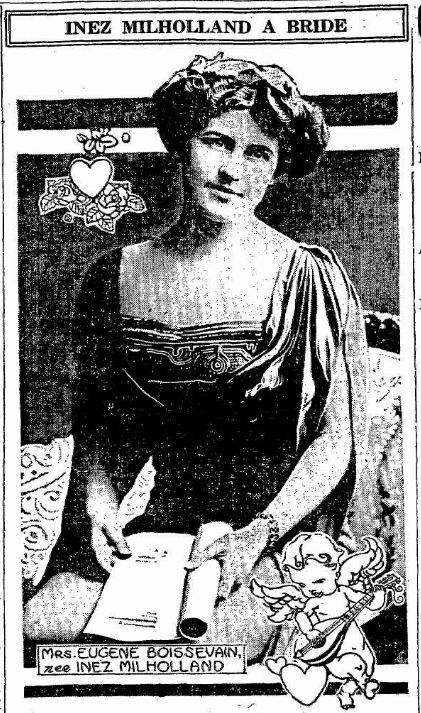 It was not joyful excitement, however, because the rumor spread that Inez Milholland, vivacious, bronze-haired, and clever suffragette, was engaged to be married to Sydney Smith. In other words, the rumor had it that Miss Milholland and Mr. Smith, both warm friends of Mrs. O.H.P. Belmont, had formed a friendship under the guiding influence of Mrs. Belmont, and that perhaps the energy and enthusiasm of the most picturesque suffragette would be lost. There was a jingle of telephone bells as suffragettes hunted for Miss Milholland. There was suppressed grief and an occasional sob over the thought the young woman might give up law, forsake the cause of woman suffrage, and become an ordinary housewife or a society matron. Miss Milholland was not in the Hotel Manhattan. She was in the New York University Law School, digging out cases and hunting for points that would prove the right of women to vote. At least her mother thought so. Mrs. John E. Milholland was likewise frantic over the rumor of the reported engagement. “No, it was not true. It could not be true,” she said. But the fearful mother quickly put in a hurry telephone call for the university. Miss Milholland was found finally in the law library poring over a musty tome and racing to get our her lesson, as she was planning a suffragette meeting for the young men of the law school in the evening. When the young woman was reached she listened calmly as her mother recited the details of the alleged engagement. “What does all this mean?” asked the excited mother. 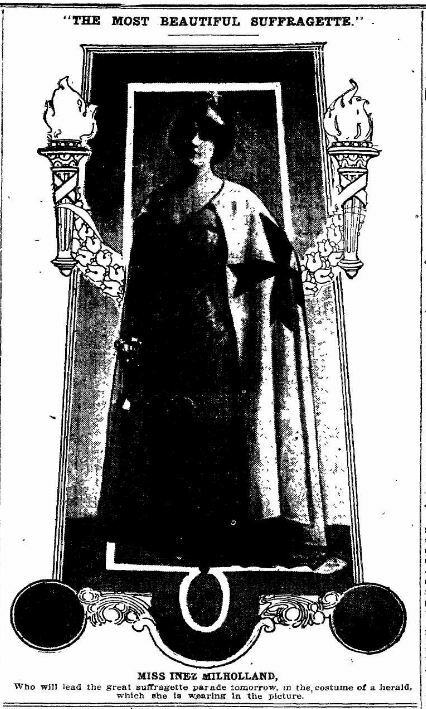 Miss Milholland, who is a daughter of John E. Milholland, one time politician and now a millionaire promoter, with headquarters in London, is an alumna of Vassar. She stood near the head of her class, was a star debater in college, and always an advocate of woman suffrage. She kept things lively in college with her organizations and her fights for her rights. She passes much of her time in England, where she is regarded as the most beautiful suffragette. Her advocacy of woman suffrage, her skill and eloquence as a speaker, won her the admiration of Mrs. Belmont, and the two have become almost inseparable. The suffragettes who have been marching on Washington already had their troubles. I understand that when they left one place the hens quit the coops and started to follow them. And a rooster flew in front of a speckled hen and asked her for heaven’s sake to go back, and she crowed in his face. I recollect hearing about a suffragette who was making a speech. She said: “I pant for the right to vote. I pant for the right to exercise my political rights.” And some one in the audience spoke up and said: “Lady, you pant for a pair of pants.” — Representative Heflin, on the floor of the House. NEW YORK, March 21. 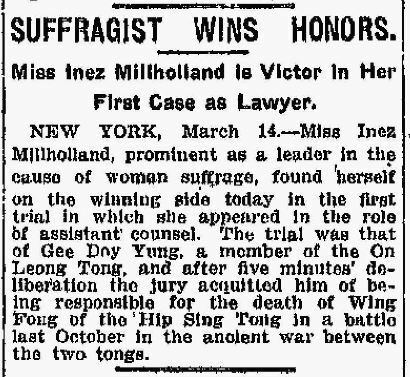 — Miss Inez Milholland, known as the most beautiful suffragette in New York, who has just been admitted to the New York bar, is working on her first case as associate counsel to James W. Osborne, defending Gee Doy Young, a Chinatown gunman, who is charged with having started the last Tong war that resulted in five killings. Miss Inez Milholland, the handsome New York suffragette, was married in the Kensington registry office, London, to Eugene Boissevain, a wealthy Dutchman of Amsterdam. The bridegroom, who is 33 years old, is engaged in the wireless business and was introduced to Miss Milholland in New York a few weeks ago by Signor Meroni. His father, Charles Boissevain, of Amsterdam, is the owner of rich plantations in Java. He is also the principal owner of the foremost newspaper in Amsterdam. The couple will spend their honeymoon in a cruise on the North sea and will sail for New York in August. Miss Milholland was graduated from Vassar in 1909, and while there she kept the faculty on pins and needles with her advanced views on feminism and socialism. It was she who started the suffrage movement in Vassar, enrolling two-thirds of the students in the cause and then proceeding to teach them the meaning of socialism. She held a record for throwing the basketball. The bride will continue her law practice when she returns to New York. LOS ANGELES, Nov. 27. — Mrs. Inez Milholland Boissevain, widely-known suffragist and welfare worker, died in a hospital here shortly before midnight Saturday night after an illness of 10 weeks. She was 30 years old. Mrs. Boissevain was stricken suddenly while addressing the recent political campaign and fainted on the platform at the meeting. She was removed to a hospital and her husband and parents rushed from New York to join her here. Miss Vida Milholland, her sister, was with her when she was stricken and has been in constant attendance since that time. Inez Milholland Boissevain had been for many years well known for her activity as a woman suffragist, a social welfare worker, an advocate of socialism and as a practising lawyer. In July, 1913, she married by a civil ceremony in London, Eugene Boissevain, a wealthy Hollander. In 1916 she went as a delegate on the Ford Pence Ship, but left the party at Stockholm, because, as she said in a statement, “the undemocratic methods employed by the managers are repugnant to my principles.” Mrs. Boissevain was born in New York, August 6, 1886, receiving her early education in New York, London and Berlin. 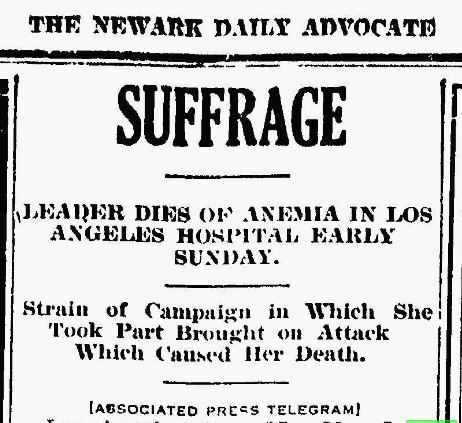 Strain of Campaign … Caused Her Death. Mrs. Boissevain’s illness was diagnosed as aplastic anemia and blood transfusion was resorted to in attempts to improve her condition. Miss Vida Milholland twice gave blood for this purpose and on four other occasions friends submitted to the ordeal in hope that benefit would result. After each transfusion temporary improvement was followed by relapse…. It was stated that Mrs. Boissevain’s trouble originated in her tonsils, which became inflamed as the result of too constant speaking during the campaign. 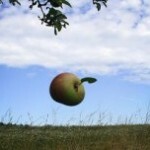 She had been weakened by overexertion and when she became ill her system failed to resist the advance of the disease…. As a student at Vassar college, 1905-9, although known as the college beauty and possessed of wealth and position, she shunned society as such and shocked the more conservative college opinion by her radical social views…. Later the same year  she went to Italy as a war correspondent and was forced to leave Italy by the authorities there because of her pacifist writings…. She was a member of the Political Equality League, Women’s Political Union, national child labor committee, Woman’s Social and Political Union of England and the Fabian Society, England. LOS ANGELES, Nov. 27. 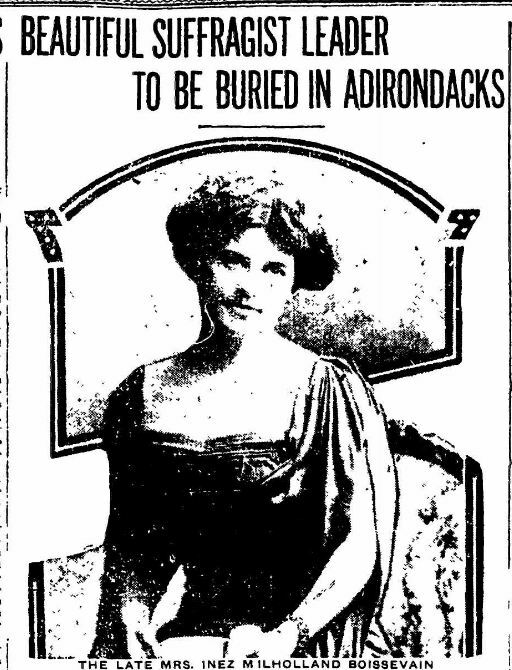 — Preparations were being made today to take the body of Mrs. Inez Milholland Boissevain, who died here Saturday night, to New York City for funeral services and thence to Meadowmount, in the Adirondacks, the old family home of the Milhollands, where the burial will take place…. Aside from her college activities, she worked among the poor children in the city of Poughkeepsie, and had herself appointed probation officer. During her first college vacation she visited London and there joined the Pankhurst suffragettes, making several speeches and being once arrested…. Following her graduation from Vassar College, she attempted to enter Harvard Law School, but his permission was denied her on the ground that it was not a coeducational institution. The incident gave rise to a heated newspaper controversy in which Inez Milholland and other prominent feminists took part. She also became active about this time in the working girls’ cause, taking part in the shirt waist makers’ strike. In the clash of the strikers with the police she was arrested and locked up, but after a controversy of several weeks the charge against her of leading an unlawful assembly was finally dropped…. 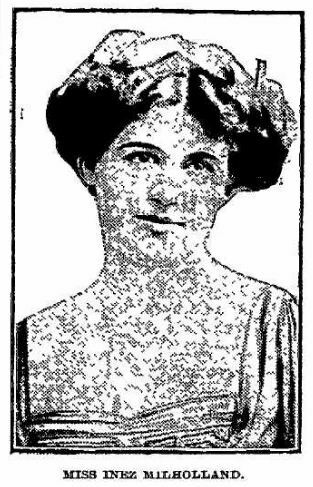 She began the practice of law in 1912 as a clerk in the offices of James W. Osborne, her first case being the defense of “Red Phil” Davidson, charged with murder of “Big Jack” Zelig. Her next case was the defense of Gee Doy Yung, accused of murder in a Chinatown tong war, and she was successful in obtaining his acquittal…. HAD A MANIA FOR LOOKING UP ANCESTRY OF HIS NEIGHBORS. Skaneateles Man is 92 Years Old and Has an Estate Valued at $100,000 — Petition Filed to Have Him Declared Incompetent. Edmund Norman Leslie, a well know Skaneateles nonagenarian, is said to have a mania for looking up the genealogical history of his acquaintances. Skaneateles people, as a rule, are proud of their ancestry, therefore, there is nothing significant in proceedings which have been started to have the aged man declared incompetent and a committee appointed to care for his property or person. Of course, there are some people who send their family skeleton back into its hole the moment any effort is made to bring the bony creature from its closet. Not that it would make any difference, perhaps. A black sheep or two among a long line of ancestors is more the rule than the exception, but there are some who favor not some outsider delving into the family secrets. Nothing like that in Skaneateles. 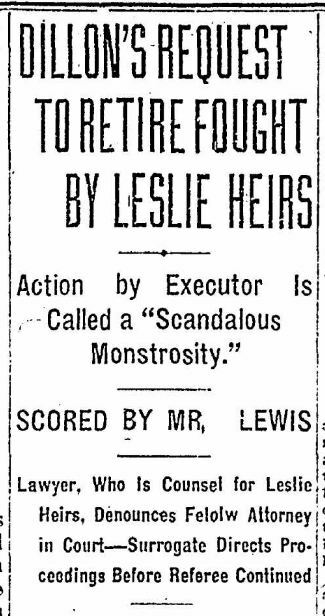 No objection was made to Mr. Leslie’s publishing a book, which was a historical review of Skaneateles with a sketch of some length of some of the more prominent families. The book was well received and Mr. Leslie was encouraged to continue his research into family histories. 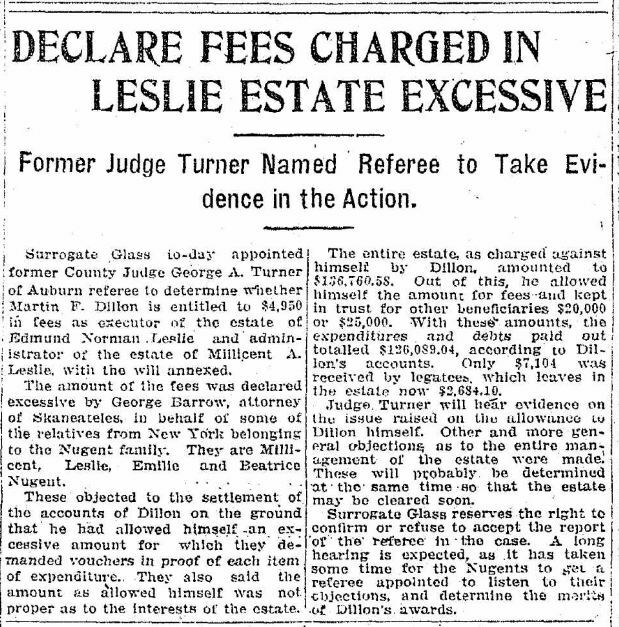 Whatever Mr. Leslie discovered will not reach the public, however, because proceedings have been started to have the aged Skaneateles historian declared incompetent and a petition for the appointment of a committee has been made to County Judge W M. Rose by Attorney Martin F. Dillon of Skaneateles. Mr. Leslie is 92 years old and has an estate valued at $100,00. He is part owner of the Mansion House at Buffalo. The committee for him has not been named. Skaneateles, May 17. — The last chapter of the old Mansion House in the city of Buffalo was closed last Monday when Martin F. Dillon as executor and trustee under the last will [and testament of Edmund Norman Leslie] conveyed the same to the New York Central & Hudson River Railroad company. For nearly sixty years one half of the same was owned by Edmund Norman Leslie of the village of Skaneateles. Edmund Norman Leslie was the son of Captain and Mrs. David Leslie. Captain Leslie was born in Scotland in September, 1780, in the parish of Monimail, Fishire. He became a noted ship captain and upon his retirement took up his residence at New Bedford, Mass. He had two children. Henry and Edmund Norman Leslie. Captain Leslie died in New York in 1835. Edmund Norman Leslie also became a ship master and many time sailed around the Horn. He retired from business and came to Skaneateles in 1851. He married Millicent A. Coe, who died March 15th, 1890. Mr. Leslie was a sturdy Scotchman and believed in doing right to all his fellowmen. He took a great deal of interest in village affairs and political battles were waged by him. 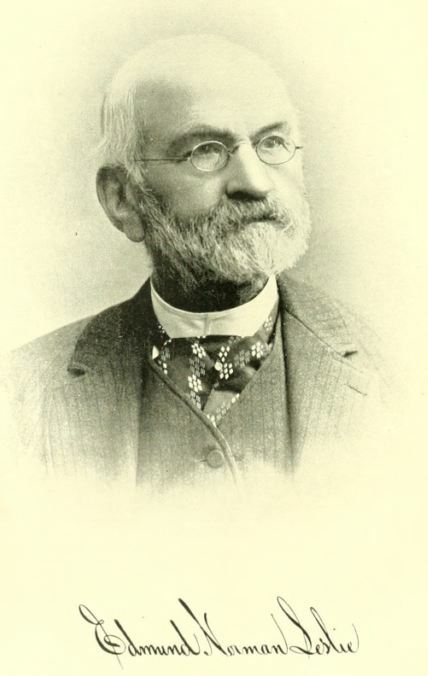 He was president of the village of Skaneateles in 1895 and 1896. He prevented the Skaneateles Water Works company from forcing the sale of its property on the village and in the face of its opposition guided the village while it constructed a new system. 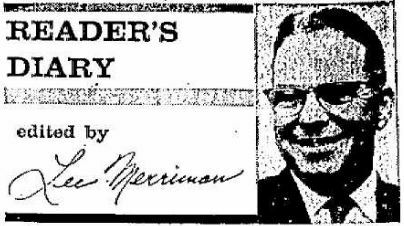 During his term of office, he also granted the franchise to the Syracuse & Auburn Electric Railroad company, preparing the franchise himself. He was also identified with the establishing of the Lake View cemetery, the Skateateles Library association and other enterprises identified with the village. He was good to the poor and each year would call upon the coal dealers to ascertain whether or not there were any poor people on their list in need of fuel. 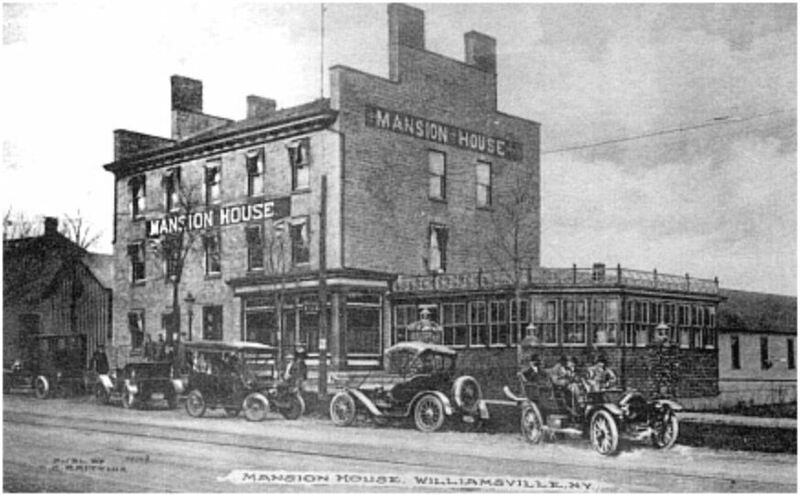 After the death of his wife, Millicent A. Leslie, he acquired an additional interest in the Mansion house in the city of Buffalo. 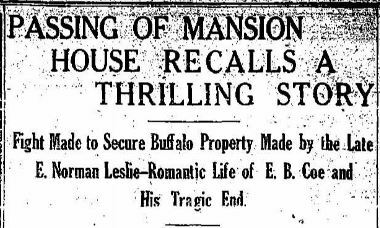 Mr. Leslie died at his home in Genesee street in the village of Skaneateles November 30th, 1908, at the age of 94 years. His only relatives were distant cousins, one of whom married Lieutenant Edward F. Qualtrough; another married Lieutenant Harrison, U.S.A., who at the time of his death had charge of Forrtress Monroe, and another married Lieutenant Mann who was killed in the Indian war. The history of the same is quite romantic. In the early “forties” Belah D. Coe owned and operated many mail and stage routes, which terminated in Buffalo. To accommodate his passengers, he built the Mansion house, which contained 285 rooms. It was a brick building and substantially fireproof, the partitions also brick, extending from the cellar to the garret. For many years, it was operated by W.E. Stafford, who became famous as a hotel man, and who went to the Waldorf-Astoria in New York. Belah D. Coe was a bachelor, and at his death in 1854, by his will, this property went to two nieces and a nephew, being Millicent A. Marshall of Buffalo, Millicent A. Leslie and Edward B. Coe of Skaneateles, and to the heirs of their body. In the event of the death of any of these people with out issue, the share was to be divided between the Buffalo Orphan asylum and the Auburn Theological seminary. Edward B. Coe left home in 1840. He was declared judicially dead in 1857, and the share of his portion in the Mansion house went to the Buffalo Orphan asylum and to his sister, Millicent A. Leslie, as the Auburn Theological seminary could not, by its charter, take and hold real estate. After the disappearance of Edward B. Coe in 1849, he became a sailor and drifted into South Africa, where he was sold as a slave. His brother-in-law, Edmund Norman Leslie, never believed him dead. He obtained from the Department of State of Washington, the name and location of all the United States consuls and commercial agents in all parts of the world. He had a circular printed in red and black letters offering a reward of $200 for any information of Edward B. Coe, at the same time giving a minute description of his person, particularly that he had his name tatoed on his left arm. These circulars were mailed to every United States consul in all parts of the world. In 1891 Edward B. Coe returned and then began the fight to recover the property left him by his uncle’s will. During the argument in court, the presiding judge intimated that, having been declared judicially dead, he had no standing in court, to which his counsel, the late William H. Seward, replied: “If such a decision is to be law in this case, Edward B. Coe, who is sitting here in the presence of this court, can go into the street and commit murder and you cannot punish him, because he has been declared judicially dead.” This argument restored the property to Edward B. Coe. He lived here for several years, but meeting business reverses, he mortgaged his property to the late Charles Pardee, who afterward acquired the same by mortgage foreclosure. IN 1875 Charles Pardee committed suicide, and this property went by his will to his daughter, Mary E. Moses. Edward B. Coe left Skaneateles for Philadelphia at which time the steamer “Queen of the Pacific” was about to leave for San Fransisco by the way of Cape Horn. After a voyage of about six weeks he reached San Francisco. The “Queen” then commenced regular trips from San Francisco to Portland, Oregon, carrying freight and passengers. 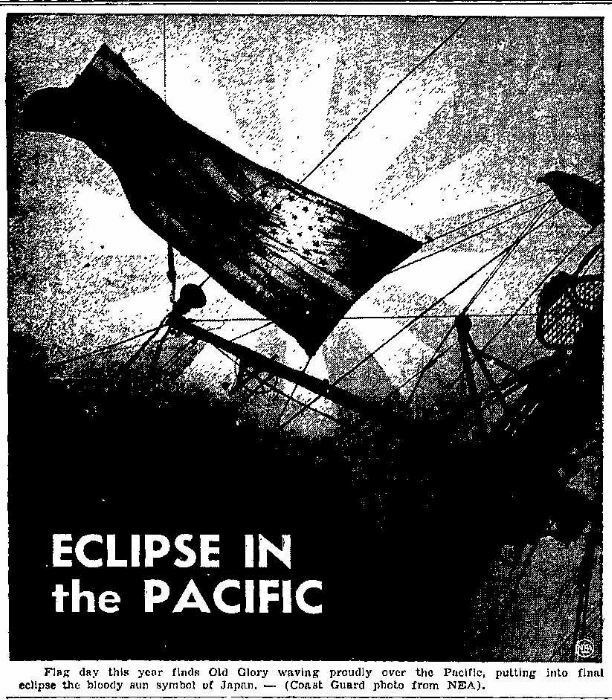 He remained on this vessel until September 5th, 1883, at which time he became despondent and fastening a large heavy lantern to his arm jumped overboard and wen to the bottom of the Pacific ocean. About that time the New York Central & Hudson River Railroad company acquired a portion of the property by condemnation, and the award was paid in court, upon the application to withdraw the same, by Millie Coe, the daughter of Edward B. Coe, then a girl 17 years of age. This indeed was a battle royal. The question raised was that she had an estate tail in this property, and her father, not having the title in fee simple, could not deprive her of it. The opposition contended that the statue of 1786 eliminated the estate tail in this country. The legal giants of that time were employed on either side, Benoni Lee of Skaneateles, L.R. Morgan of Syracuse, P.R. Cox of Auburn, Spencer Clinton and Charles D. Marshall of Buffalo. The court finally held that Miss Coe had no interest in the property. A short time after this decision, Edmund Norman Leslie acquired that interest and held the same at the time of his death in his ninety-fourth year. By his will, he devised the same in trust to Martin F. Dillon of Skaneateles, who has for two months been engaged in perfecting the title, and the deed was finally delivered last Monday. The New York Central & Hudson River Railroad company will tear down the old structure and use the land for a new $10,000,000 terminal. This will be the end of an old landmark, which had stood for nearly three-quarters of a century, during which time guests from all nations of the world have been entertained. Upon his removal to Skaneateles the want of active employment induced him to take up the subject of the early history of the town and village. He obtained two ledgers which had been kept by early merchants of 1805 and 1815 respectively, and from them secured the names of nearly all the earliest settlers, especially those who made their purchases here. He collected and preserved some very valuable historical matter concerning the locality, which was first published in a series of papers in the Democrat, afterward copied in the Free Press, and later printed in book form by Charles P. Cornell, of Auburn, N. Y.
Mr. Leslie furnished entirely from his own collections the only complete list of the names of 364 union volunteers who enlisted from the town of Skaneateles, or enlisted elsewhere, but belonged to this town, giving rank, company, and regiment, in alphabetical order, which list was published in the Free Press. He has also collected some of the most valuable files of original local newspapers, had them bound in volumes, and presented them to the Skaneateles Library Association for preservation. He has erected a beautiful memorial tablet in St. Jame’s church in memory of the sons of that church who lost their lives in defense of the Union. He has also published several series of the lives of early prominent residents of the town, notably of Lydia P. Mott, a prominent promoter of female education, who established ‘The Friend’s Female Boarding School,” which was known as “The Hive.” Many of the ladies of Auburn and surrounding country were educated at this school, which was discontinued about seventy years ago. Mr. Leslie’s labor is of a character that will survive and perpetuate his memory to coming generations. All of his valuable historical work has been done gratuitously. Gouverneur, Aug. 18. — In the town of Fowler, about seven miles east of this village, there lives the son of an old pioneer, David H. Balmat, son of Joseph Bonaparte’s land servant in this section. Mr. Balmat is more than 80 years of age, but is still active and takes a prominent part in the affairs of his town. He is one of the few representatives in this section at least, of the original French settlers, his father having come here in 1796, two years before Jean Baptiste Bossout established a ferry across the Black river. It was in the Reign of Terror in France that the pioneer came to this country to avoid the bloodshed there. David Balmat was born in the town of Carthage in 1822, a little time before his father became land agent to Bonaparte. The Balmats were people of much consequence in France and the older Balmat was the owner of a large vineyard. His mother’s sister was the Duchess of Oldenburg and as he was a moderate revolutionist, fell under the ban of Robespierre. These facts were the cause partly for sending his son to the new country. Mr. Balmat has a wonderful memory and recalls many incidents which occurred early in his time. “I do not remember Bonaparte, of course,” said the old man, when interviewed, “for he was gone before I was born. My father was his agent and used to often make trips to the southern part of the State to make his reports to him. My father was one of the first settlers of this country and I think there are three or four families now remaining to represent the early Frenchmen who came to this North country. Among them are the Bossouis, and the Devoises while others have passed away. “My father purchased land of the French company near the mouth of Beaver river, and the land was wet; the settlement was abandoned and given up. At this time the whole of this northern part of the State was a wilderness with only a few log roads here and there. My father at one time with two Indians started out from Utica, which was then a small place, and went to Beaver river. They followed the Oswegatchie to its source, then down it again in search of beaver and sent as far as Heurelton now Is. They then passed through Black lake, up the Indian river, and made a portage into the Black river. They were gone for over three months and returned loaded with beaver skins, as this section abounded in beaver at that early period. 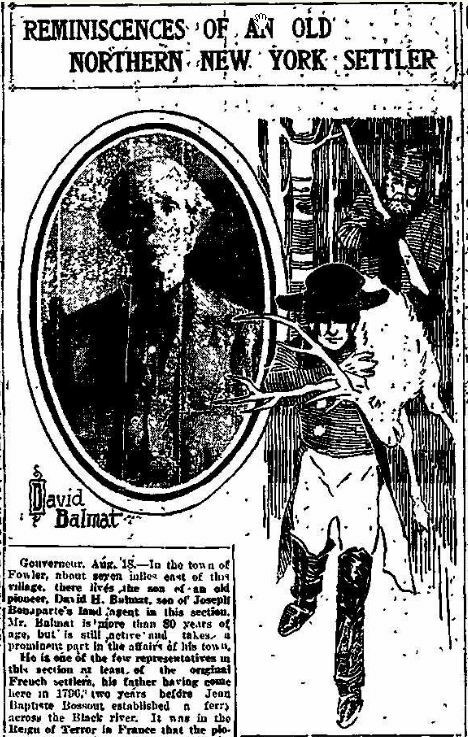 David Balmat’s grandfather was Major Goodar, who came from France during the Revolutionary war here with Lafayette with aid for the patriots. Mr. Balmat lives on a large farm and is much respected in his old age. He is an unassuming old gentleman and is gifted in his speech. He is rather proud of his physical powers at 84 years, but says that he is not so strong as his cousin, David Hewitt. David is 94. GOUVERNEUR, March 1. — David H. Balmat, one of the early pioneers of St. Lawrence County, died yesterday at his house in Talcville, aged 85 years. Around his family hangs the romance of the time of the first Napoleon and of Joseph Bonaparte, who traversed this part of the state during the early part of the nineteenth century. David H. Balmat was the son of John D. Balmat, born in Paris, France, in 1875 [? 1775] and of Nancy, daughter of Major Goodar, born near Utica. John D. Balmat died in Fowler in 1862 and Major Goodar, the father of his wife, came over from France with Lafayette and was wounded at the battle of Brandywine. To this couple was born the subject of this sketch in 1822. When Joseph Bonaparte came to this country and sought asylum in the vicinity of the lake, which he afterwards called Lake Bonaparte, he carried with him letters from the great Napoleon to John D. Balmat, and for a number of years Mr. Balmat was his constant companion and guide, and the son often spoke about his father telling of the grandeur of the surroundings of Bonaparte. 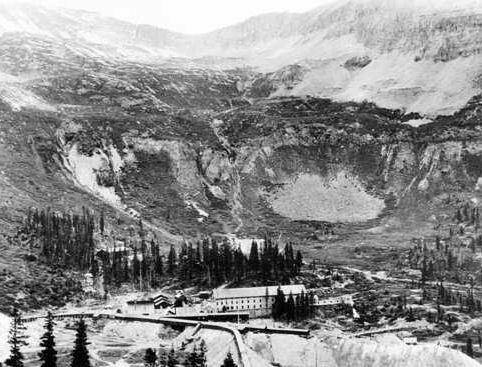 David H. Balmat was the owner of extensive farm lands which are undermined with extensive talc deposits, some of which are considered the richest in the world, and which are operated by the Union Talc Company. His is survived by four children. The funeral will be held at the family home in Fowler to-morrow. You Can’t Forget a Garden, But Can You Forget a Poet? And know a rose’s need. Where roots and tendrils are. Garden lovers will have an opportunity to indulge themselves, in imagination, in the delights of their hobby, despite Winter’s barricade against outdoor participation, when Louise Driscoll speaks on Thursday, February 20, in the ballroom of the Normandie, No. 253 Alexander Street. 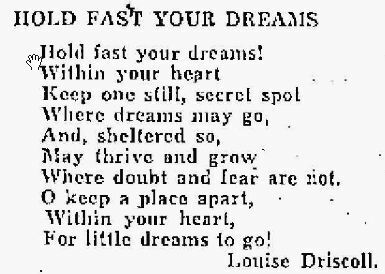 Miss Driscoll will be the guest of Mrs. George M. Forbes of Alexander Street, president of the Rochester Poetry Society, under whose auspices she will speak. I have long said one of the delightful aspects of being a newsman in Pasadena is that — no matter on what subject you write — you may rest assured that among the thousands of persons reading your stuff will be at least one of the world’s greatest authorities on that subject. Some of the most valued acquaintances I have picked up over the years have developed this way. You do a “masterpiece.” Next day the phone rings, or there’s a letter on your desk. You were right, and you know it. Or you were wrong, and you’ve picked up a world of understanding. On my desk this morning was a letter of a different type — illustrating the point I am making in another way. It was in response to a column I wrote way last spring, forgot, and then published late because I still thought it was a good column. I called it, IN WHICH I GROW SENTIMENTAL. It was built around re-discovery of this poem, which, half forgotten from my boyhood days, nonetheless had carried me through many tight places. Here’s the letter I found on my desk. L.M. — I was very much interested and pleased to see, in your column, a quotation from a poem by Louise Driscoll. Louise — who died some years ago — way my cousin. She was for many years, head of the library of Catskill, New York, and was a poet of quite considerable reputation. 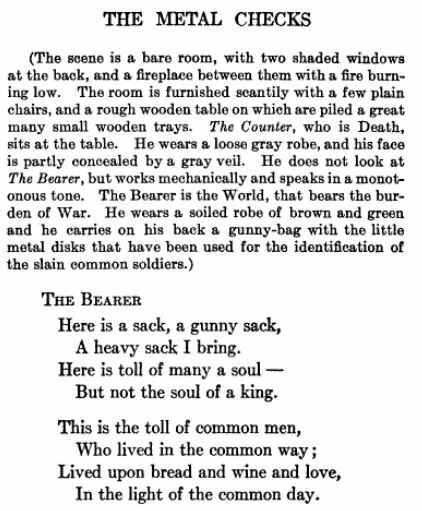 In the days when poetry, to be publishable, did not have to be (a) an imitation of the New Yorker, or (b) something just long enough to fill that annoying gap at the end of a magazine page. I am sure it would have made her very happy to know that one of her poems was remembered. See what I mean about the delightful aspects of being a newsman in Pasadena? Three Kingston women, seven residents of Woodstock, one Palenville and one Catskill woman are members of a group of outstanding women of the nation selected for inclusion in “American Women,” a who’s who of the feminine world just completed and published. The honor was attained locally by Mary E.S. Fischer, illustrator, Melvina E. Moore-Parsons, and the late Mary Gage-Day, physicians of Kingston, Mrs. J. Courtenay Anderson, Agnes M. Daulton, Harriet Gaylord and Louise S. Hasbrouck, writers, Nancy Schoonmaker, lecturer, Lily Strickland, composer, and Mrs. Bruno L. Zimm of Woodstock, Jennie Brownscombe, artist, of Palenville, and Louise Driscoll, librarian, of Catskill. New York state has contributed 1,096 of the 6,214 women chosen for the distinction of places on the list. Eighty-two per cent attended college and the majority are active in clubs and organizations. The possibility of success for a career and marriage combination receives strong endorsement from the fact that 41 per cent of the roster are married. Approximately a third of the list, in true feminine fashion, declined to state their age. Writers formed the largest class, numbering 800, and professors the second with 355. Four each are engaged in aviation and astronomy, five in engineering and thirteen in the ministry. Gardening is the most popular hobby. Only sixty-four like to play bridge and one goes in for hunting mushrooms. 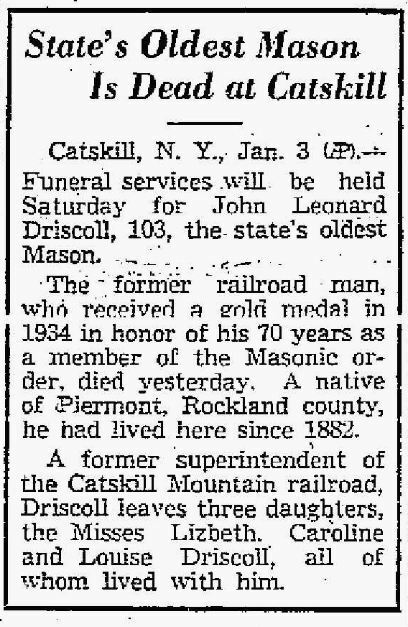 CATSKILL — Masonic services will be held tonight for John Leonard Driscoll, a native of Piermont, Rockland County, and oldest Mason in the state, who died yesterday at his home. 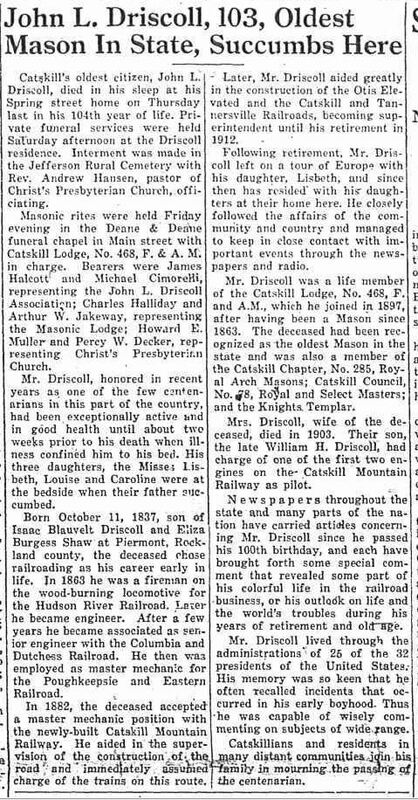 Mr. Driscoll, who had been in remarkable good health until two weeks ago, was 103 years old last October eleventh. Mr. Driscoll was a descendant of Johannes ver Vailen, one of the holders of the Harlem Patent who had an inn and a ferry at Spuyten Duyvil in the early days of the state. His father was Isaac Driscoll and his mother Eliza Burgess Shaw. His great-grandfather came to the United States from Ireland about the middle of the Eighteenth Century. Surviving Mr. Driscoll, who had lived under twenty-five of the nation’s thirty-two presidents, are the Misses Lizbeth, Caroline and Louise Driscoll, all at home. 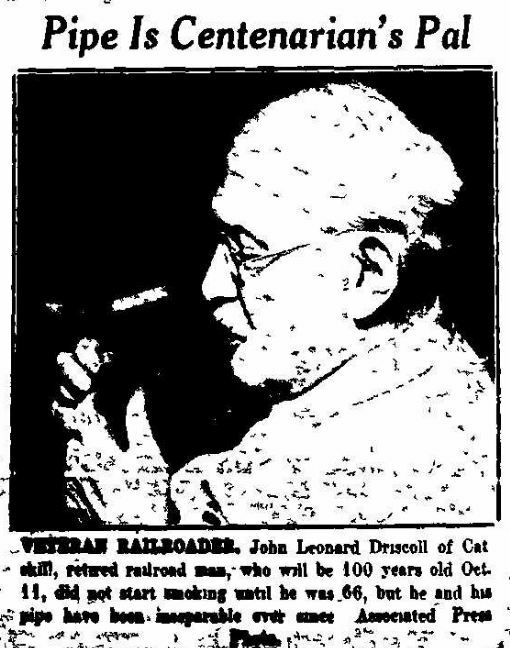 As a boy Mr. Driscoll witnessed the digging of holes and the planting of rails for the Hudson River Railroad. Until the age of sixty he had never smoked. He first tried a cigar, without becoming sick, and then changed to a pipe which was his favorite and constant companion during the last few years of his life. * I couldn’t find obituaries for Louise or her sisters. 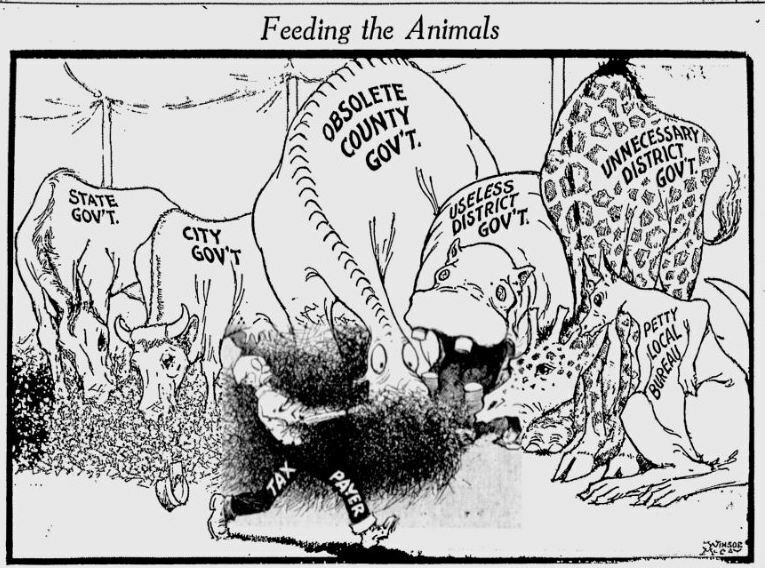 It is possible there were some in the Greene County Examiner-Recorder, but I don’t have access to the years they would have appeared. A shame, really; Louise was a very talented lady and I would like to know more about her. She was Eliza Burgess Shaw, mother of Carrie, above, and in 1862 was the widow of Isaac Blauvelt Driscoll (#6010) in 1836. Isaac died in 1851. Their children who lived were John Leonard Driscoll, born 1837, lived to be 103; Charles Francis, born 1841; and Caroline, born 1844. Eliza was a seamstress, per the 1860 census. 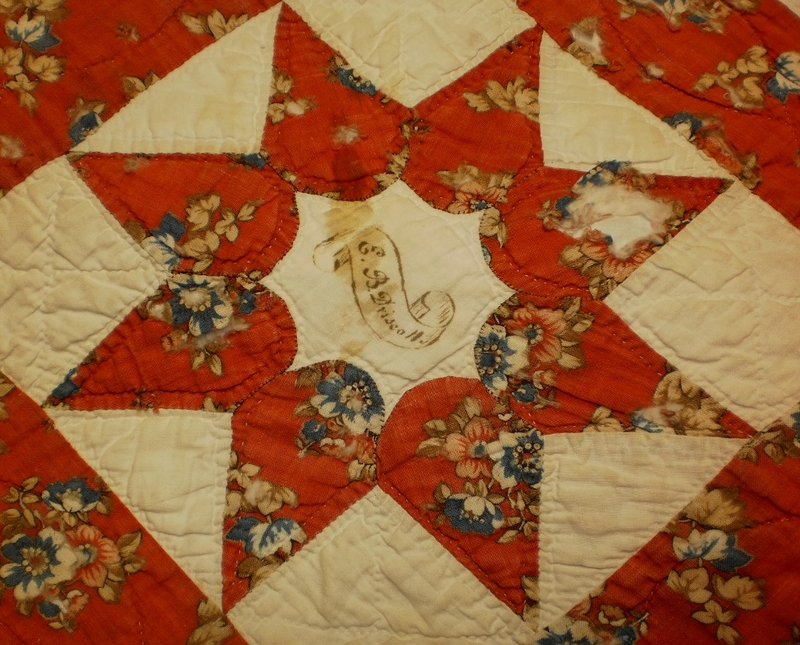 Read more about the quilt at the link. Louise Driscoll, who had a story, “The Tug of War,” in Smith’s Magazine for May, and a novelette, “The Point of View,” in the June number of the same magazine, lives in Catskill, N.Y. She has written verse since she was a very little girl, and while still a schoolgirl used occasionally to send poems to the New York newspapers and different magazines, many of them being accepted. It is only within the last few months that she has tried to do much prose, and she says that she has found the editors of the American magazines so ready to receive and educate a new writer that she has no faith in the tales so often heard concerning the necessity of influence to gain attention. Her verses have appeared in Lippincott’s, the Critic — now Putnam’s Monthly — the Independent, the Metropolitan, and a number of other periodicals, and some of them have been widely copied. One poem, “The Highway,” which appeared in Lippincott’s about three years ago, brought her a good many letters from readers, including some editors of other magazines. Miss Driscoll in now at work on a longer and more serious book than “The Point of View,” which is her first long story. She is very ambitious and believes fully in hard work, but she says she writes because she must, and is sure she would write if she had never heard of type. Incidentally, she has a large regard for the English language, and a sincere desire to use it correctly. One act tragedy for two men and two women. Realistic play of American rural life and the tragedy of weakness and lack of determination. la la la la la la la la la la la la. lentää kuin lehti ilman tiellä. In the woods the trees, the trees are gay. 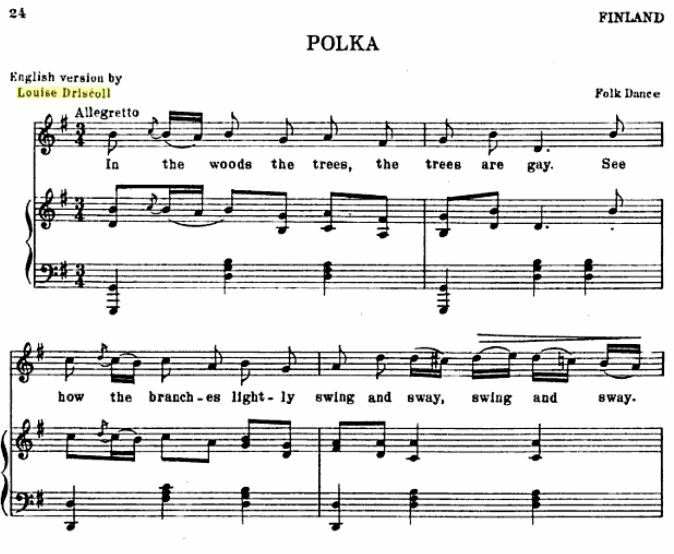 See how the branches lightly swing and sway, swing and sway. So sing the maidens, tra la, la,la, la,la. 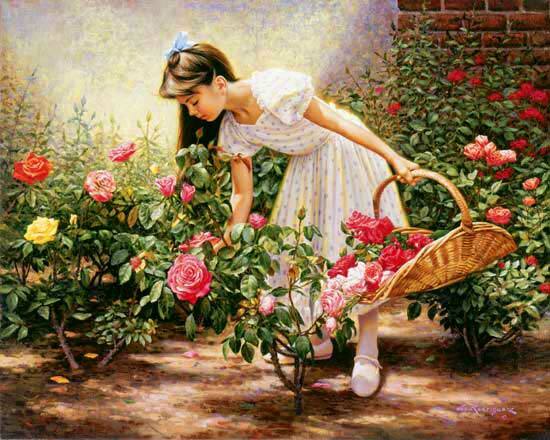 Is a girl’s heart when the rose is showing. And falls while she is singing_Tra la, la,la,la,la. Right in public assembly to preach. Nothing that is right do we refuse. Vets’ broken bodies, spirits, they mend. Were gold, when taps for heroes was sung. Privileges so great none can measure! 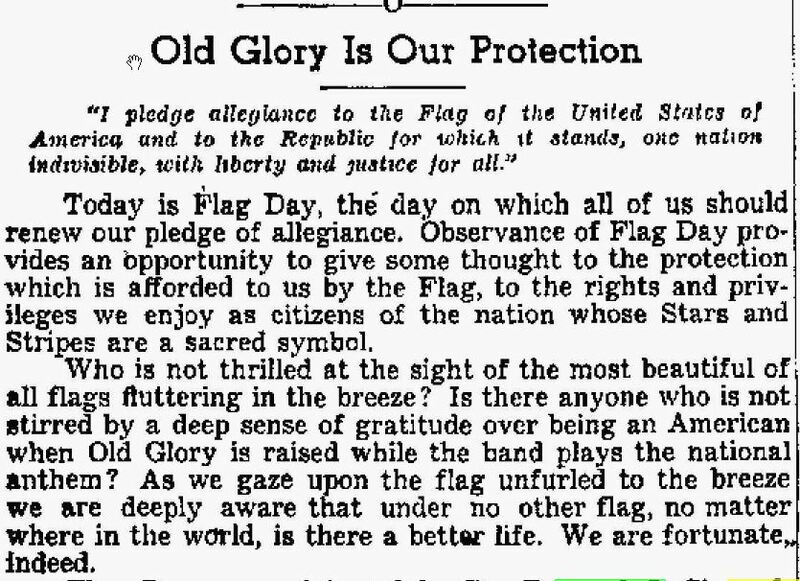 Ample opportunity will be afforded Sunday for the public to participate in observance of Flag Day. The people will be paying homage Sunday for the last time — officially — to the 48-star flag. It is the standard the people have known longest — since Arizona was admitted to the Union in 1912. The 48-star flag will be superseded on July 4 by a new flag recognizing Alaska as the 49th state. The life of the new standard will be brief. On July 4, 1960, it will be replaced by a flag with a 50th star for Hawaii. 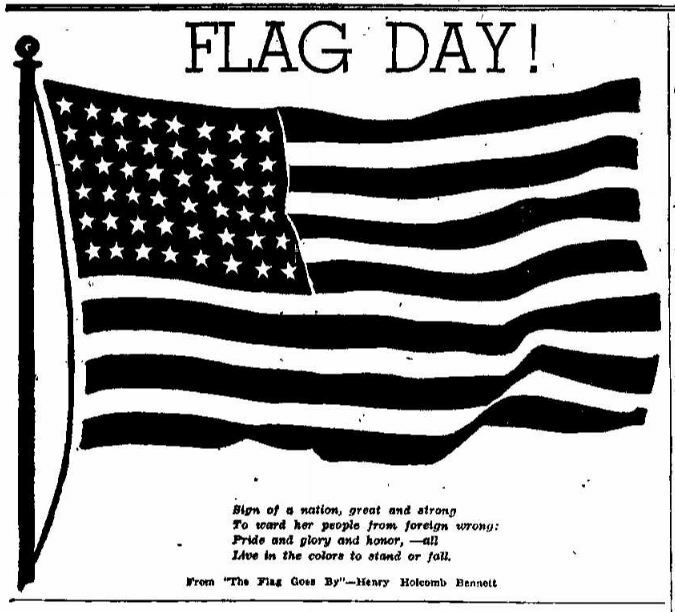 Observance of Flag Day dates back to June 14, 1885, when Dr. Bernard Cigrand, then a 19-year-old teacher at the Stony Hill school near Wauheka and Fredonia in Ozaukee County, had his students write themes on the subject of the American Flag. The next year he proposed that the day be observed nationally. 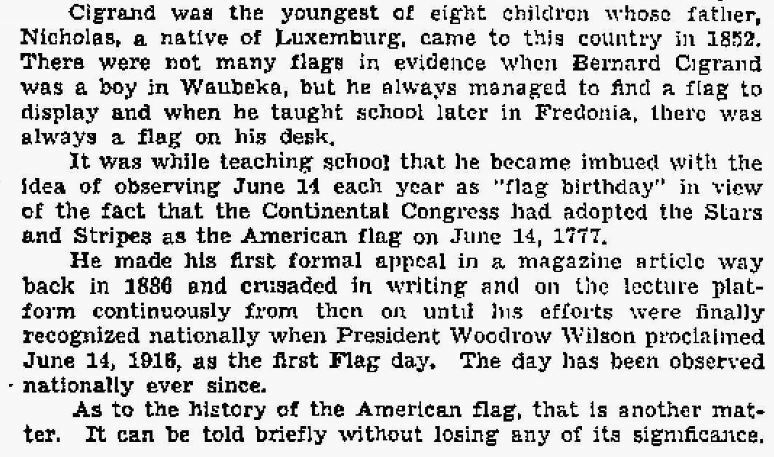 However, it was not until 1916 that President Woodrow Wilson issued an official Flag Day proclamation. In observing Flag Day, it would be well to note that a number of countries have adopted the Red, White and Blue in tribute to the encouragement given them by the United States in their efforts to gain independence. This is particularly true in regard to the Republics of Liberia, Cuba, Panama, and the Philippines. Each of these independent nations directly owes its existence to the fact hat such a course was fostered by your country. As a result, their flags derive from the Stars and Stripes of the United States. The refusal of Spain to withdraw troops from Cuba led to occupation of the island by American forces. After the defeat of the Spanish in 1898, American military rule continued only long enough for the Cubans to adopt a constitution and elect their first congress. This congress met for the first time in 1902. Granting full freedom for the Philippines was more recent. It took two wars to wrest the Filipinos from Spanish and later Japanese rulers. They obtained full freedom in 1946, shortly after World War II, and at a time when the Russian Communists were destroying freedom in such countries as Latvia, Lithuania, Estonia, Poland, Czechoslovakia, and large parts of the Balkan area. The red, white and blue flags of these countries provide the answer to the claims of Russian Communists that our country is imperialistic. Further answer is found in this country’s favorable attitude toward efforts of other areas to gain independence. Thus, in paying tribute to the U.S. Flag tomorrow, we will be recognizing not only the freedoms enjoyed in our country but in other republics as well. 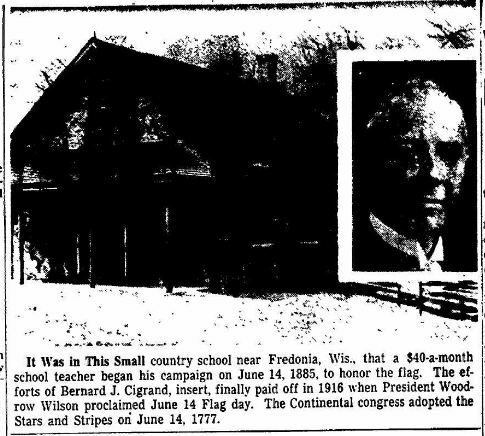 As in previous years, Flag Day ceremonies will be held at the Cigrand memorial in Waubeka early Sunday afternoon and at the restored Stony Hill schoolhouse at 4:30 p.m. 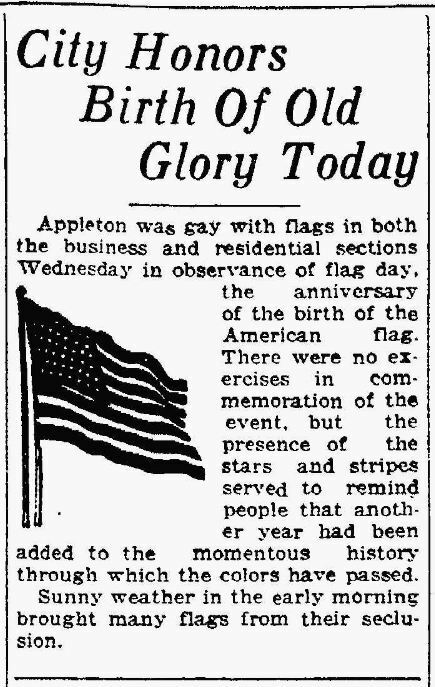 Locally, a special Flag Day program has been arranged by the Sheboygan Lodge of the Elks, beginning at 1 p.m. with a motorcade from intersection of 8th Street and Ontario Avenue to the Elks Club at 1943 Erie Ave.
We are also reminded that display of the flag throughout the community will be an important contribution to the observance of Flag Day. Born to glorify the earth. Fought all the way . . .
How our GRAND FLAG was born. From a coward’s grave . . . The glory of every American. The Fate of a Girl in Male Attire. 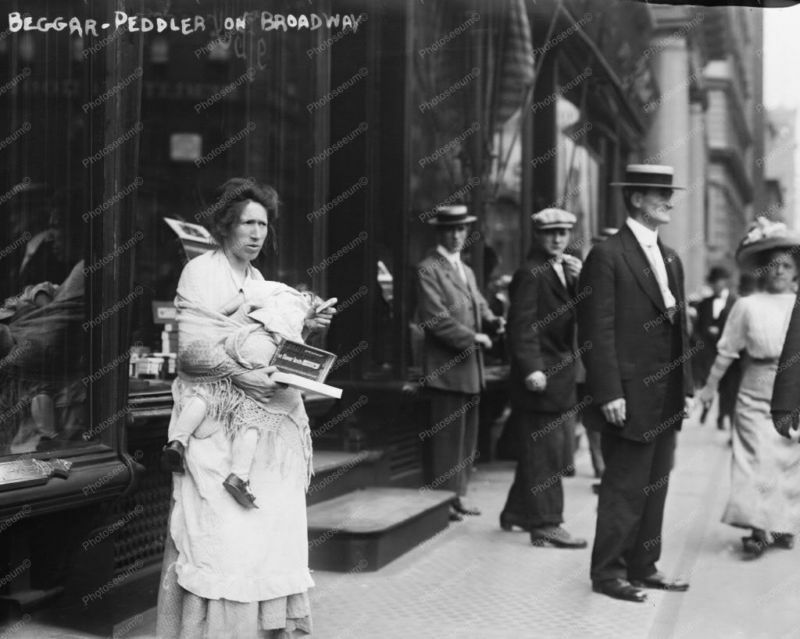 Several years ago, Jennie Westbrook of New York, who had been earning $7 a week as a saleswoman in a dry goods store in that city, concluded to do better. So she donned male apparel, and passing for a good looking young man, acted as waiter in a restaurant for $15 a week, and finally became book-keeper and confidential clerk for a firm who paid her $1,500 a year. Somehow or other, her secret became known to those embodiments of Truth and Purity, the bummer police of New York, and she was arrested, tried, and sentenced to imprisonment for the awful crime of wearing male attire and honestly working for a man’s pay. 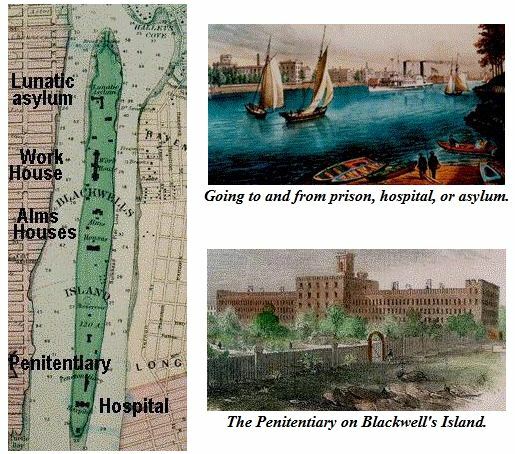 She went to Blackwell’s Island prison, therefore; but it is a pleasure to state that in a day or two, the outrageous foolishness of her punishment had created such a fussing in the great city that she was released. Last August, on the nineteenth day, the Democratic Union, the Democratic Clubs, the Democratic Veterans and the Democratic Lawyers of the State of New York met in their annual joint convention in the city of Elmira. The outcome of that session was a historic resolution, adopted UNANIMOUSLY, which is known as the Elmira Declaration. “The State of New York, outside of New York City, is divided into FIFTY-SEVEN COUNTIES, which are cut up into 932 towns, 59 cities and 535 villages, and in which there have been organized fire, water, lighting, sidewalk and improvement districts to the number of 2,467 districts and 9,504 school districts — a total number of 13,497 municipal units outside of New York City. “Each levies taxes, the same property often being levied upon by FIVE OR MORE AUTHORITIES. The tax burden of this devouring collection of governmental absurdities is rapidly becoming UNBEARABLE. Demands for TAX REFORM are becoming more and more insistent. But the plain fact is, NO tax reform can be extensive or really effective until the enormous expense of useless government is abolished. The Legislature meets in January. The Democratic party should proceed FORTHWITH to carry out its Elmira Declaration — and the Republican Party should give its patriotic assistance to the reform. This issue transcends party lines. The tax-oppressed people must have RELIEF from the ruinous burden — and the time for that relief is NOW. 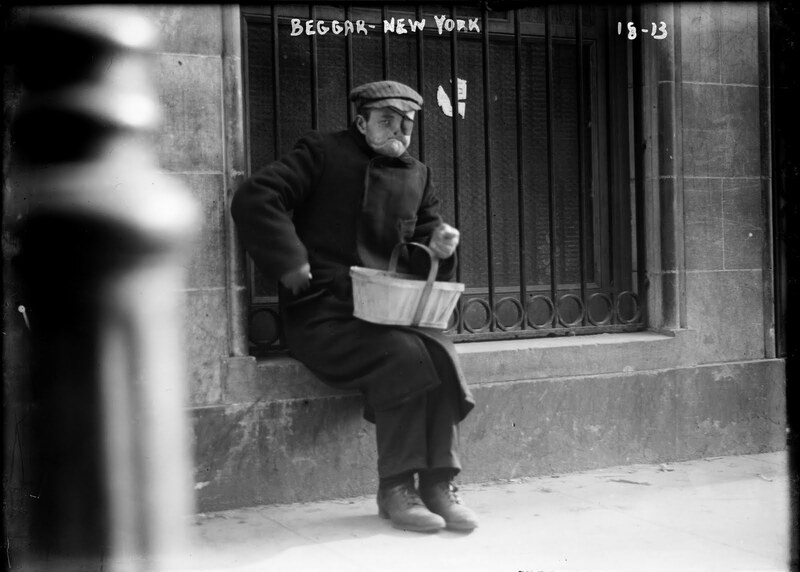 New York, if not the paradise, is certainly the Eldorado of beggars, and certain parts of New York are literally overrun with professionals of both sexes and of all ages. The lower sections of the city are infested with blind men, old merchants, decayed brokers, woe-begone foreigners, and a horde of dirty little wretches, who, under pretense of selling matches, apples, penknives, and neckties, thrive on beggary. The vicinity of the city hall develops a different stratum. 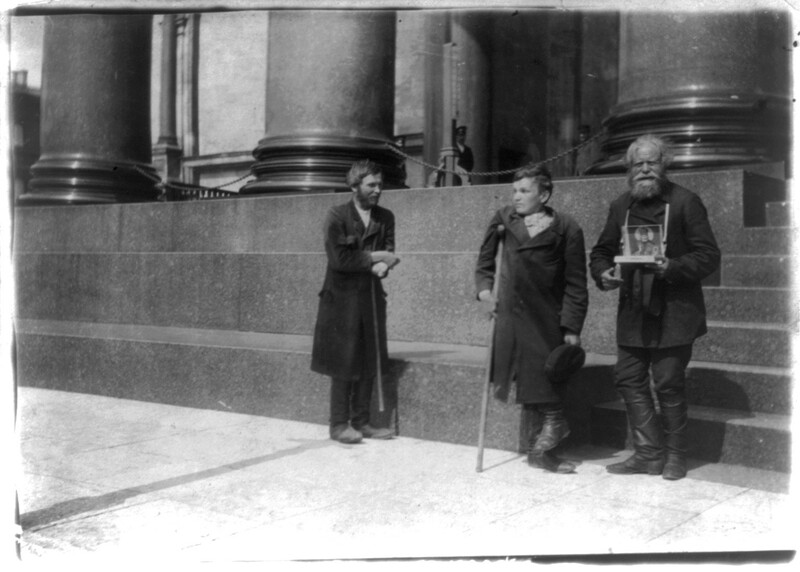 Several blind men, whose faces are as well known as that of the city hall clock, stand bareheaded in all kinds of weather, holding in one hand a few lead pencils and in the other a hat, into which they beseech the charitable to throw a few pennies. Respectable looking fellows stand near the entrance to the bridge, and, under pretense of having lost their money, beg a penny from the passers. Slatternly dressed women, with babies in their arms, seek alms near the postoffice and on the pavement of the city hall park. The very poor abound everywhere, and the humbug poor are almost as numerous. A favorite resort for the latter class is Park place, between Broadway and the station of the Sixth avenue elevated road. Oftentimes something like half a dozen men, women and boys are encountered in that one short block. 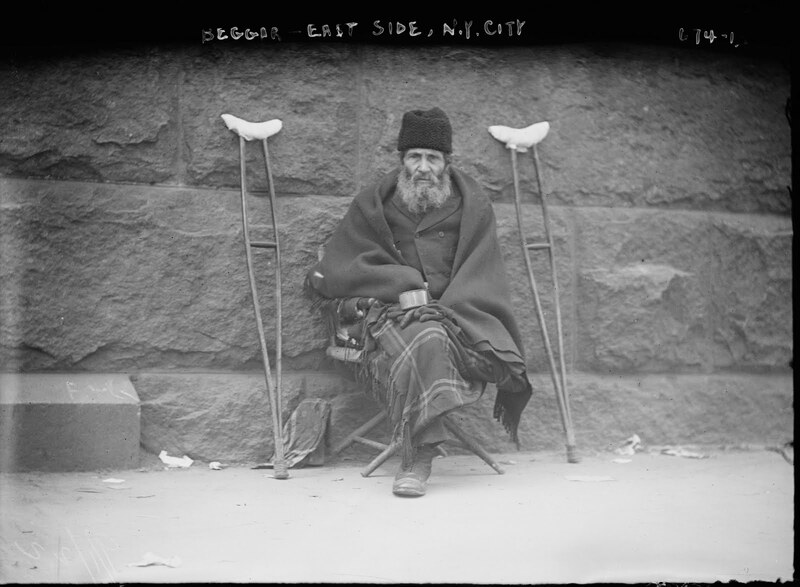 One persistent beggar, who long since was driven from Wall street, exhibits the stump of his leg, and with most woe-begone expression, solicits aid. Boys playing leap-frog one minute and begging pennies in the next find that sidewalk a particularly lucrative spot. Seedy-looking men have selected that as their beat, and can be found there almost every day and every night. One stalwart fellow, with piteous whine, offers to black belated comers’ boots for the trifling sum of a penny, which offer being declined is followed by a piteous appeal for pecuniary assistance. A one-legged Alsacian, the great Napoleon, holds ballads in one hand and a hat in the other. Several fellows extend shriveled limbs, horrible sores, and loathsome wounds, this revelation being a trick of their trade, as they well know the benevolent heart associated with a sensitive stomach, will quickly turn away and pay roundly rather than have a second glance of unsightly deformity. 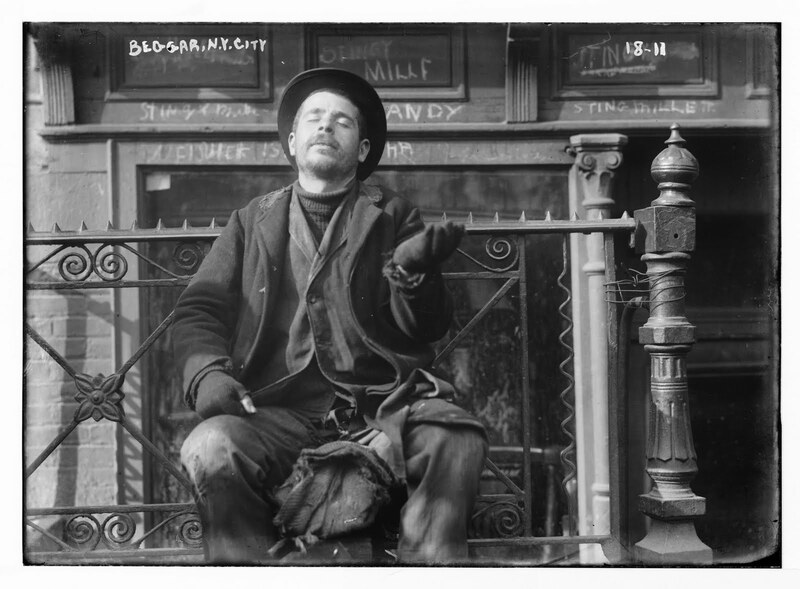 A particularly offensive type of beggar is an old woman, hideous in face, dirty in dress, who accosts ladies, and, under the pretense of offering hairpins for sale, thrusts her dirty hand into their faces. If money is given her she accepts it and passes to the next; if it is denied her, or she is told to go away, she opens the sluice-gates of her billings-gate abuse and makes it really difficult for an embarrassed, delicate person to escape her clutches. One old woman is well known to the habitues of the Twenty-third street bobtail cars as she is to the police. Her little game is to enter a car and suddenly ascertain that she has “but 8 cents” with which to pay her 5-cent fare. She is in no way backward in making her condition known, and it is a very strange care which does not furnish two or three benevolent people who are not only anxious to pay the old lady’s fare, but who slip a dime or a quarter into her willing hand. Another, equally venerable in appearance, has a sad knack of losing her way, and asking how she “shall reach Christopher street ferry” or Hoboken or Brooklyn or some other far-away locality, manifests great surprise and grief at the distance she must go and in a way known to her makes her impecuniousity understood and has her wants relieved. But these, and such as they are comparatively harmless to the wretches who, in the persons of two or three old hags, wander up and down the street between 4 and 6 o’clock in the summer time, and even later in the fall and winter months, making the avenue really a place of terror to modest, belated women. Their plan is to suddenly accost ladies, and in tones of command demand assistance. If it is given, all right; if it is not, abuse of the most virulent type is heaped upon the offender, who is lucky if she gets away without a push or a haul. 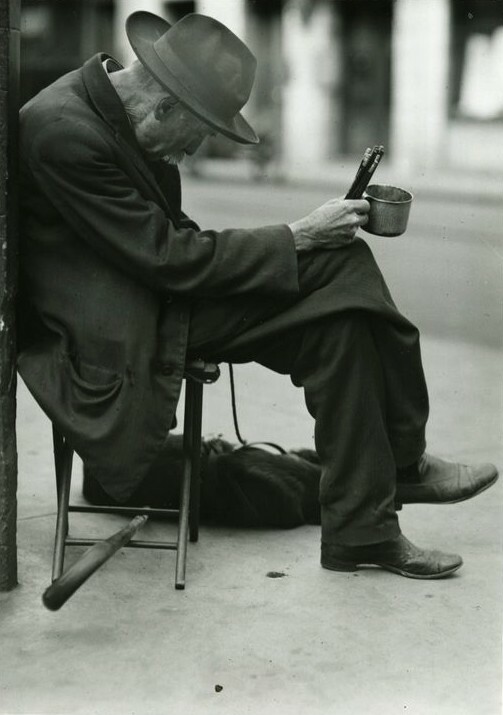 On the church steps not far from Seventh avenue sits, and has sat for years past, a weather-beaten blind man, who has the same rubber headed pencils in his hand to-day that he had two years ago. He has been known to receive thirty contributions in the space of an hour. 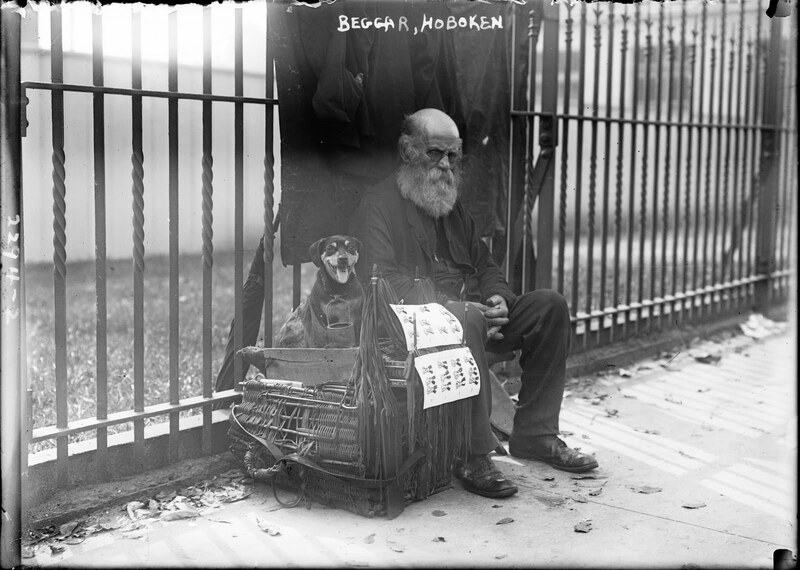 Another man, blind, has a little white dog crouched between his feet, whom he keeps there for hours at a time, while he, extending his palm, solicits contributions for the blind. On Forty-second street Italian women, with Madonna-like faces and any quantity of cherubs, abound. They have a faculty of throwing into their eyes a most mournful expression, and in broken English ask for good American money. The favorite game there, however, is a pretense of a loss of money, although the aged-clergyman racket is also worked with great success. 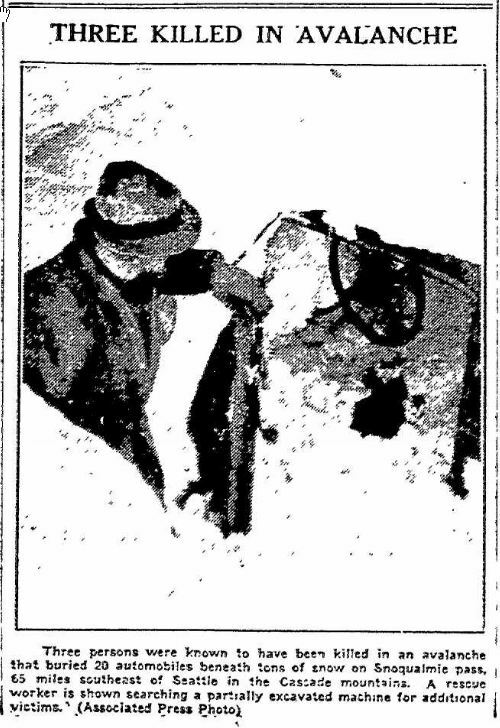 The jolly sailor, who was familiar to the riders in Broadway stages five or six years ago, turned up in Forty-second street depot last week, and received a contribution toward his winter expenses from old customers and from strangers that must have delighted the innermost cockle of his heart. It was irresistibly comical to watch his repulse of criticism from people who knew him and his story as well as he knew it himself. The police say that some of the men who hang around the Third avenue and Forty-second street station and work the beat between that point and Fifth avenue are most adroit simulators. They are blind to-day, crippled to-morrow, respectable clergymen the next day, and honest men who have “lost their pocket-book” before the end of the week.